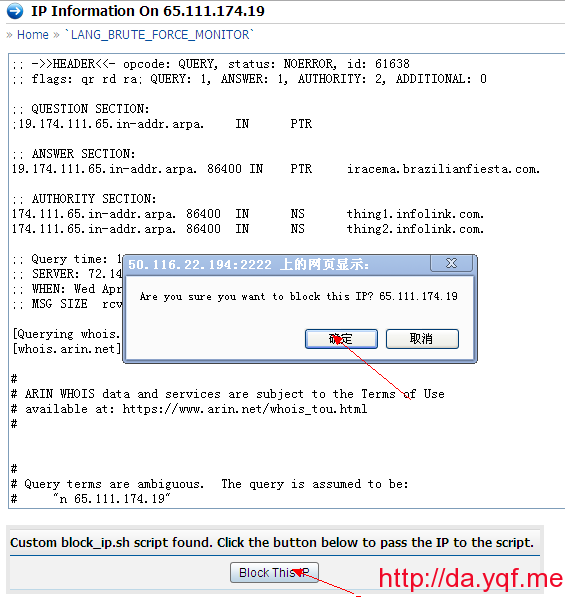 去DA后台操作下Home–>Brute Forece Monitor–>IP info–>Blcok this IP. and don’t forget to chmod the block_ip.sh to 755. 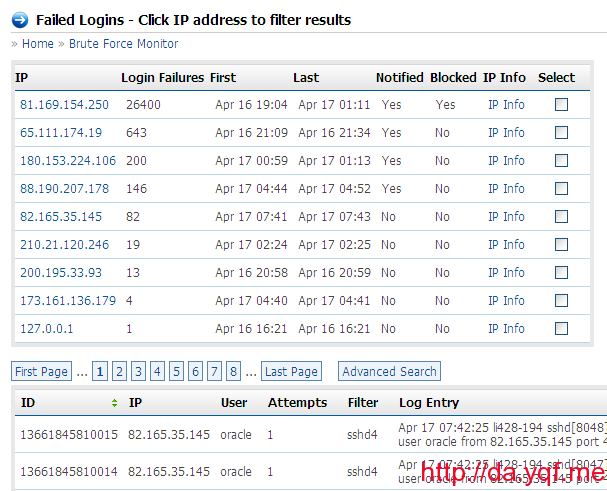 This entry was posted in DirectAdmin安装教程 and tagged Brute Force Attack, CentOS, DA教程, directadmin on April 17, 2013 by yqf.me. setquota: Mountpoint (or device) / not found or has no quota enabled. setquota: Not all specified mountpoints are using quota. User added to ssh config file. quotacheck: Your kernel probably supports journaled quota but you are not using it. Consider switching to journaled quota to avoid running quotacheck after an unclean shutdown. quotacheck: Cannot stat old user quota file //aquota.user: No such file or directory. Usage will not be substracted. quotacheck: Cannot stat old group quota file //aquota.group: No such file or directory. Usage will not be substracted. quotacheck: Old file not found. 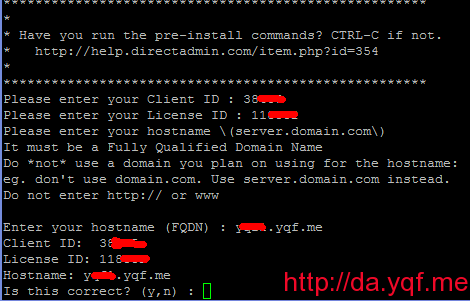 This entry was posted in DirectAdmin安装教程 and tagged CentOS, DA教程, directadmin, quota on April 17, 2013 by yqf.me. 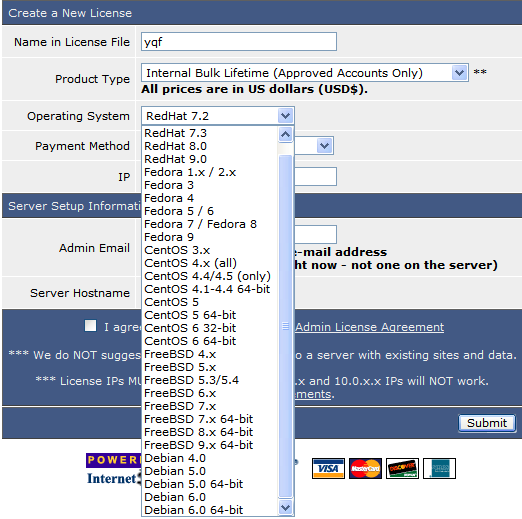 This entry was posted in DirectAdmin安装教程 and tagged CentOS, DA教程, directadmin on April 16, 2013 by yqf.me. This entry was posted in DirectAdmin购买 and tagged 300元, DA团购, directadmin on April 16, 2013 by yqf.me. If my memory is correct, any Ubuntu version after (and including) 11.10 uses Debian 7, thus it’s not yet supported.Versions 9 and 10 (for the most part) use Debian 5, so things in betwen (prior to 11.10) would use Debian 6.If unsure, just install Debian 6. 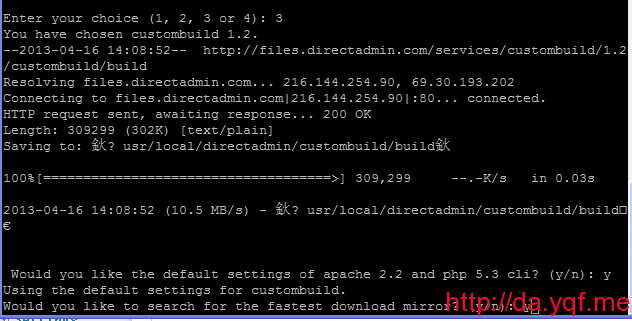 Check the /etc/debian_version prior to installation. This entry was posted in DirectAdmin安装教程 and tagged directadmin, ubuntu on April 16, 2013 by yqf.me. This entry was posted in DirectAdmin安装教程 and tagged directadmin, linux on April 16, 2013 by yqf.me. This entry was posted in DirectAdmin安装教程 and tagged DA价格, DA退款, DA面板, directadmin, 主机面板, 虚拟主机 on April 16, 2013 by yqf.me. 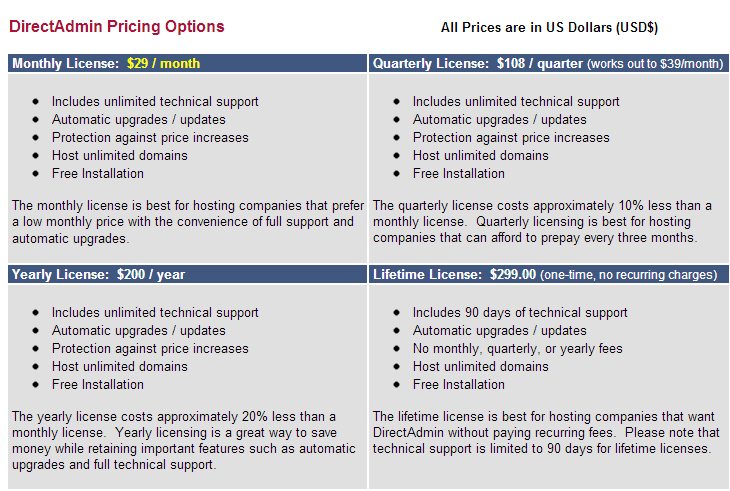 Gary orders three DirectAdmin monthly licenses and finds that he likes his old control panel software better. Fifteen days after the purchase he requests a refund on all three licenses. A few days later Gary purchases one more DirectAdmin monthly license for a different server. Once again he finds that DirectAdmin isn’t for him. He cannot request a refund because he had a previous chance to try DirectAdmin. This entry was posted in DirectAdmin购买 and tagged DA价格, DA退款, DA面板, directadmin, 主机面板, 虚拟主机 on April 14, 2013 by yqf.me. This entry was posted in DirectAdmin购买 and tagged DA价格, DA面板, directadmin, 主机面板, 虚拟主机 on April 14, 2013 by yqf.me. This entry was posted in DirectAdmin购买 and tagged DA面板, directadmin, 主机面板, 虚拟主机 on April 14, 2013 by yqf.me.